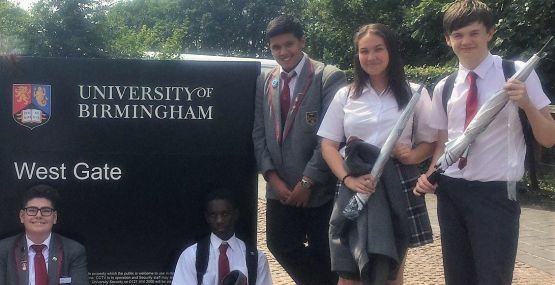 Birmingham University’s School of Engineering and Physical Sciences was the venue for a day of discovery this week for L5 pupils from Highclare Senior School, in Erdington, Birmingham. During a series of workshops on robotics, medical engineering, mathematics and particle physics pupils were able to participate and learn. 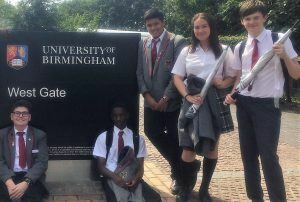 They all had a great day and an insight into studying STEM subjects at university. In the particle physics workshop, pupils analysed data from CERN and two of the HIghclare Pupils won prizes for correctly identifying the Higgs-Boson particle. Highclare Senior School welcomes pupils from age 11 years to 18 years. Places are availble now for pupils starting into Years 10 and 12 in September 2017. Go to our admissions page for more information.